Inspired staging and knockout performances bring to life the story of heavyweight champion Jay Jackson in a play that tackles the turbulent history of African-Americans in boxing. 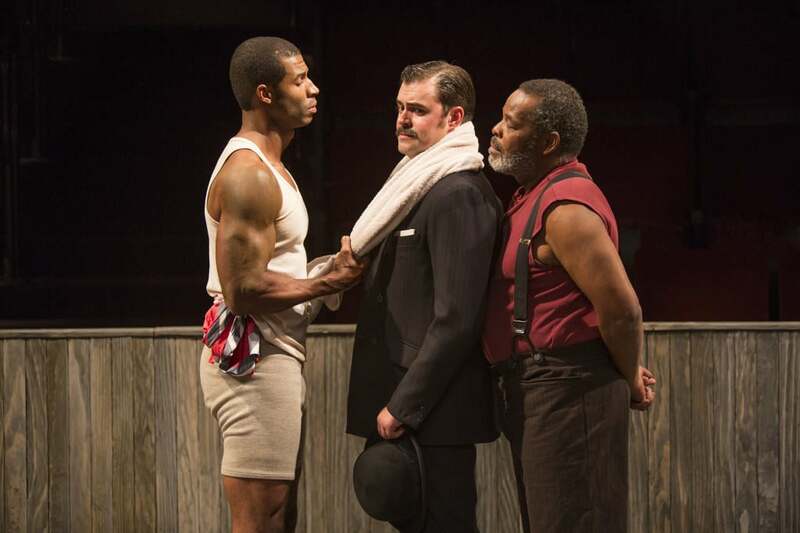 Tensions run high in an artistically depicted boxing match at The Old Globe. Photo used with permission from Jim Cox via The Old Globe. 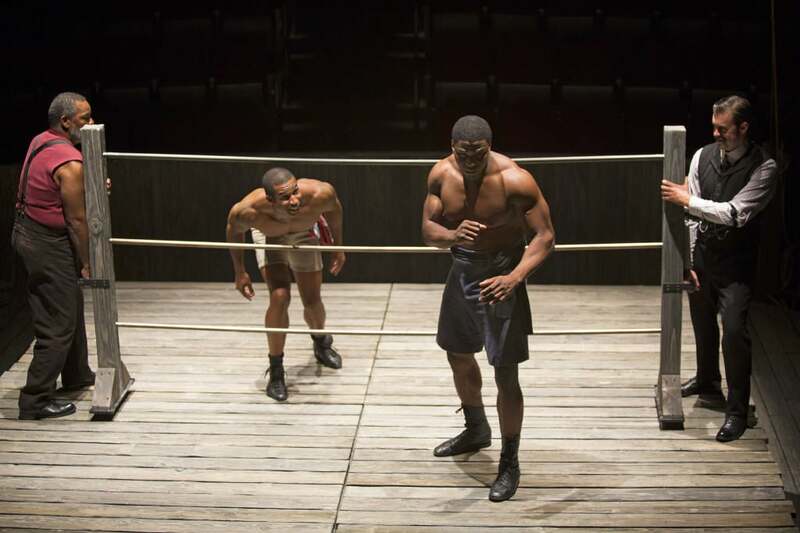 A play about boxing without actual boxing seems paradoxical, but if it’s a production at the Old Globe with a talented ensemble, director and playwright to boot, then somehow a play about boxing without actual boxing appears ingenious. Tracing back to America’s roots in African-American civil rights struggles, “The Royale” — directed by Obie Award winner Rachel Chavkin and writer Marco Ramirez (best known for “Orange is the New Black”) — explores the complicated politics of sports as it intertwines with racial tensions of the early 20th century. Inspired by the story of Jack Johnson, the first African-American heavyweight champion, Jay Jackson (Robert Christopher Riley) realizes that the segregated world of boxing could endanger more than just his own safety. “The Royale” refuses to beat around the bush of early 20th century racial issues. Photo used with permission from Jim Cox via The Old Globe. Let’s start with the obvious: How does a boxing match without the thrust of fists seem plausible? Through precise timing and choreography of punches through the air (but not physically making contact), along with a wide range of staging effects, synchronized claps by the cast members, the ring of the bell and taut lighting over an arena format. Distinct and noticeable at first, this style of the play becomes firsthand and natural to the audience as the play goes on simply because the emotional punch between each action becomes more heavy and powerful. Combined with a minimalistic set — including a wooden boxing ring, a bell and a chair — the cast really made use of a simple design to heighten the chaotic world of the characters. Each punch becomes significant when the audience realizes how much is at stake for Jackson. The extensive range of emotions Riley has to master for this show is incredibly vast; his character is plunged through a journey that initially starts as a thirst for fame that becomes a complex issue of race. 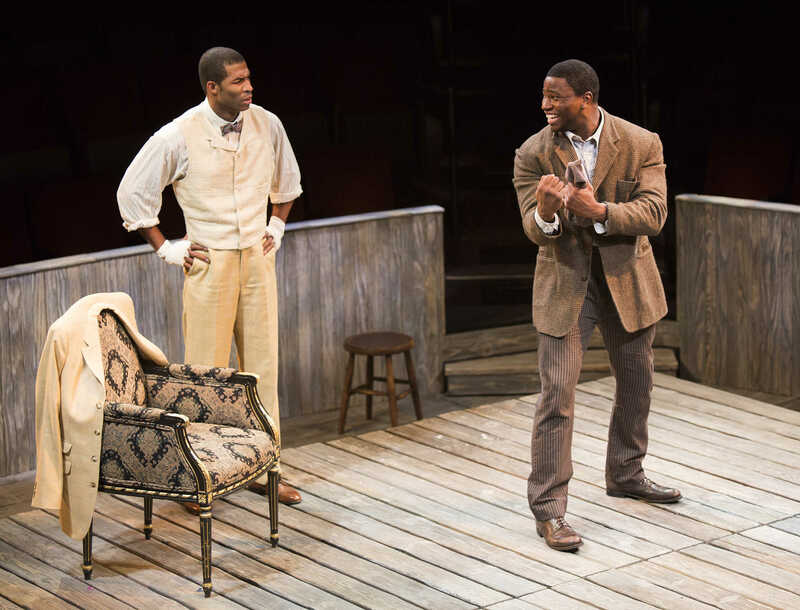 At the start of the play, Jackson taunts Fish (Okieriete Onaodowan), an African-American heavyweight boxer with potential, because Fish is unworthy of the challenge, encouraging the audience to clap along with him. His unabashed ambition for reputation suddenly halts when he realizes the danger, forcing him to ponder his actions when social unrest strikes the media about the possibility of an African-American defeating the white heavyweight champion. Dreams take flight in this heavyweight of a play based on the life of one of the first well-known African-American boxers, Jack Johnson. Photo used with permission from Jim Cox via The Old Globe. Toward the end, Jackson can barely hold a steady rhythm of claps juxtaposed to his previously seamless efforts as he emotionally forces himself to make decisions onstage. These are tugged at by his sagacious coach Wynton (Ray Anthony Thomas) and greedy boxing promoter Max (John Lavelle), whose conflicting interests among the three contribute to a chaotic experience. This is only exacerbated by Jackson’s sister, Nina (Montego Glover), who fears not only for the safety of her brother but also the African-American community, as well. Each one of these actors comfortably dons their roles: There’s a dynamic between their relationship with Jackson that really makes him ponder his decisions wisely. Part of playwright Ramirez’s brilliance is that Jackson’s internal strife makes it difficult to predict the outcome of the plot. Jackson’s world and journey in the spotlight is filled with sharp turns that contribute to the rigid, tense atmosphere toward the final 30 minutes of the play. Just as we think things are about to settle, the conflicting character’s desires complicates matters further — and these emotions show greatly in the final match. It’s a combination of brilliant staging, acting and structure of the play itself that contributes to a wonderful experience that flashes back to the struggles of African-Americans in 1905.